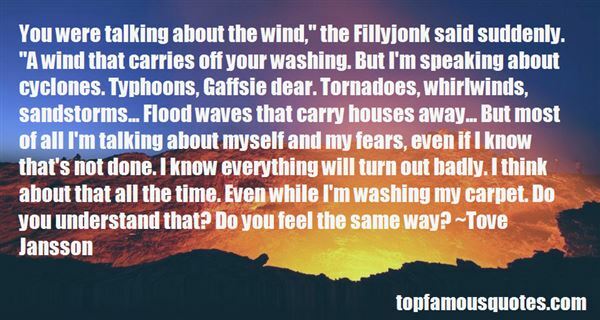 Reading and share top 5 famous quotes and sayings about Cyclones by famous authors and people. 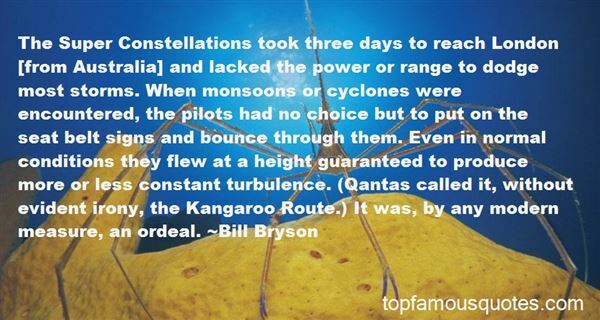 Browse top 5 famous quotes and sayings about Cyclones by most favorite authors. 1. "The Super Constellations took three days to reach London [from Australia] and lacked the power or range to dodge most storms. When monsoons or cyclones were encountered, the pilots had no choice but to put on the seat belt signs and bounce through them. Even in normal conditions they flew at a height guaranteed to produce more or less constant turbulence. (Qantas called it, without evident irony, the Kangaroo Route.) It was, by any modern measure, an ordeal." 2. "Cyclones cannot see you if you don't move""That's dinosaurs you crazy fruit bat!" 3. 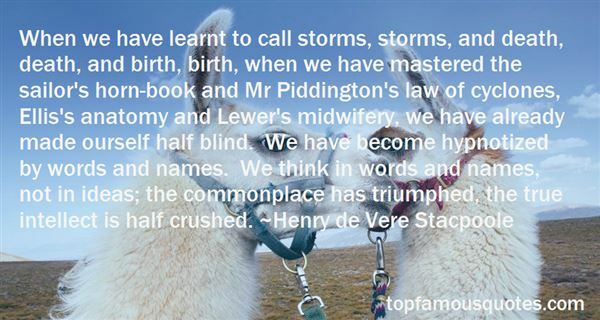 "When we have learnt to call storms, storms, and death, death, and birth, birth, when we have mastered the sailor's horn-book and Mr Piddington's law of cyclones, Ellis's anatomy and Lewer's midwifery, we have already made ourself half blind. We have become hypnotized by words and names. We think in words and names, not in ideas; the commonplace has triumphed, the true intellect is half crushed." 4. "When cyclones tear up Oklahoma and hurricanes swamp Alabama and wildfires scorch Texas, you come to us, the rest of the country, for billions of dollars to recover. And the damage that your polluters and deniers are doing doesn't just hit Oklahoma and Alabama and Texas. It hits Rhode Island with floods and storms." 5. "You were talking about the wind," the Fillyjonk said suddenly. "A wind that carries off your washing. But I'm speaking about cyclones. Typhoons, Gaffsie dear. Tornadoes, whirlwinds, sandstorms... Flood waves that carry houses away... But most of all I'm talking about myself and my fears, even if I know that's not done. I know everything will turn out badly. I think about that all the time. Even while I'm washing my carpet. Do you understand that? Do you feel the same way?" Rivera rubbed his temples. "Satan told you to do it?" he said wearily."No.""Elvis? ""I told you, it's supernatural."